There are two functioning Shapeoko2's. The one Bruce has been training on works very well. There's a 1/4 inch (I believe) bit in it, and I have a 1/8th inch bit which anyone can borrow. The Shapeoko2 near the door is Sven's and I've noticed that it is constrained on the Y access by the construction; that is, if the table moves too far under the router, which is fixed on an X bar, then it can't move very far side to side. If you look at it closely you will understand. My guess is Sven will re-build it when he gets back, or explain why it is the way it is. However, it has lead screws so is probably more precise than the other Shakeoko2 so perfect for small projects, or ones narrow by X and long by Y.
I've used (http://easel.inventables.com/) on both Shapeoko2s and have found it great to learn on. You can design, configure the machine, and do a carve all from one browser based piece of software. It remembers your stuff in the cloud, so assuming the Hackspace's wifi is working :) you can easily pick up from where you left off. The following is a bit of my accumulated wisdom on using the Cambridge Hackerspace’s Shapeoko 2 CNC router. This router can be used to carve 2d and 3d shapes in wood, metal and plastics. I’ll include some basic notes about how I got going with the router. Whereas 3D printers are "additive" manufacturing techniques, a CNC mill or router is “subtractive” — you can create forms out of a wide variety of existing materials. This creates a terrific advantage in terms of durability but comes at some considerable costs of complexity and lack of shape flexibility. Coming from the perspective of 3D printing — which is currently in vogue right now — CNC milling is a very different animal. 3D printing is pretty simple. With a reasonably well set up machine you can generate print after print and get something you generally expect as long as you don’t stay too far from the default settings. I’ve been able to load STL files into Repetier and with a few clicks get a print I’m happy with using our Printrbot maker edition. The machine is quiet and can be left unattended. This is not the case with CNC. When starting out with CNC milling, get ready to embrace the reality that the toolchain and print process is comparatively more complex and it might be a long time before software hackers really "automate" it the same way they have for 3D printing. Each specific sequence of machining operation needs to be set up in the CAM software and user driven choices made during Gcode generation. You have to decide on end-mill, on feed rate, and think through a decent roughing pass as well as a finishing pass. Expect to spend a lot more time in front of a computer. Also most 3D shapes you’d find on thingverse or other such sources have overhangs and other features that are not well cut out for CNC. In practive you have to really design with CNC in mind. Some great sources for insight on this: http://www.shapeoko.com/wiki/index.php/Designing_for_Fabrication and http://lcamtuf.coredump.cx/gcnc/full/. Another key difference: mechanical forces and tolerances matter a whole lot more. With additive manufacturing, side from the extruder which can be finicky, the mechanics of the 3D printer don’t seem to undergo a lot of stress. With CNC routing, there is much more that can go wrong with the hardware itself. The router faces very real mechanical stress and vibration during cutting. Bits wear out and die. Belts slip due to the forces involved creating potential for inaccuracy. Also, the orientation of the head of the device is much more critical - there is effective 2 extra axes of rotation that now start to matter, whereas a 3D printer nozzle generally just has to point down. As a result, I’ve noticed that you have to make a lot of tradeoffs to make sure your print settings are appropriate otherwise you’ll face a lot of accuracy and precision issues. The CNC controller is responsible for understanding where the bit is at all times and firing off the servo motors to execute your milling operation. In the simplest setup, you "zero" the machine at some point on the stock when you start a milling operation. From this origin point all other operations take place. Unlike various 3D printers, or more sophisticated CNC mills, there is no limit switches to “zero” the machine automatically. Also the Shapeoko cannot see any movements you make that it doesn’t control. Moving the machine manually is OK but you always have to tell the controller to reset its idea of where it is. The very best place to locate the origin is usually on the top of the stock. There is a massive quality vs. time tradeoff in CNC work. I just finished a 90 minute print with a scalloping finishing pass at 0.02 inches on a ball-end mill for an object about 2 inches in diameter. Even with this hyper- accurate finishing pass, there are plenty of ridges I now need to clean up or sand. 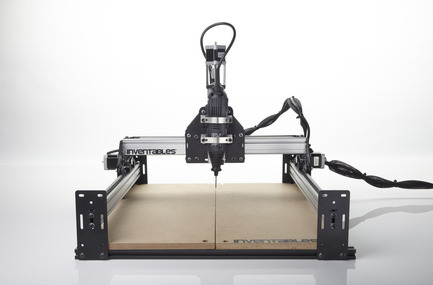 The 2D workflow is the simplest and most approachable on the Shapeoko. 2D mode is where all cuts ultimately reach the same level and there is no contouring or complex Z geometry. 2) Locate the objects relative to the origin, the solid line. I usually have to pan down and to the left to see it in makercam at least on a mac. Profile: Traces the path of an object on the stock. The width of the cut is the width of the bit. Pocket: Carves out a space in the stock (possibly going all the way through it). 6) [Optional but recommended for understanding] Preview your work in a tool like OpenSCAM. Set the tool size to match what you plan to use and simulate. You will get a nice 3d object showing you what the mill will produce. 7) Put a bit into the spindle and lock it down. A flat end-mill with two flutes is best for most 2D operations I’ve tried. 8) With eye and hearing protection, fire up the spindle and check that there is no visible wobble. Shut the spindle down when you are satisfied everything looks good. Also recheck the tightness of the frame that holds the spindle in place. 9) Fire up a tool such as Universal GCode Sender or GrblController. Note that the first is more reliable, but the second allows some previewing of the GCode which is useful to confirm the mill will do what you want. 10) Now position zero on the mill to where you positioned the origin in MakerCam. This means moving the bit to a point on the wood where the design starts. I recommend placing the zero point at least a little bit above the stock, enough that a thin sheet of paper can just barely move. This helps make sure you don’t cut all the way through the stock, leaving a paper-thin bit of wood holding the design together. 12) Start the spindle, and put on eye and ear protection. The Shapeoko is not really that loud but if you plan to sit right next to it for more than a minute your ears will thank you for the protection.